ClassBug is a user-friendly class management software for venues such as dance and yoga studios, martial art dojos, and parks and recreation centers. Users can manage and schedule classes, offer online registration and payments, and view various types of reports. ClassBug’s web store is quick to setup and offers fully automated online registration and sales. The point of sale (POS) process includes sales options such as discounts and coupon codes, gift cards/store credit, requisite classes, memberships and waiting lists. Users can manage and add classes to a color-coded schedule, as well as track instructors and students with automated reports and attendance sheets. Using the instructor reports, users can see all work history for managing payroll, as well as view upcoming schedules for timetable planning. Student reports keep track of student activity such as missed classes with date information. The attendance reports automatically generate attendance sheets ready for printing, or for using within the solution. ClassBug is web-based; so users do everything right in the browser, and can login via smartphones and tablets with access to the internet. The software has automatic updates, so users will always stay up-to-date with the latest version of ClassBug. Upgrading to the professional version includes 3 unique user logins that can be used by managers, receptionists and instructors, at the same time. I really like the look and overall function of the software. It would be great if the calendar linked to the calendar I use daily (Google calendar). Also, on the "list of classes" page, it would be nice to see the classes listed in order of the days of the week.I started using this because I needed my studio to be able to take automated payments each month. This has saved me a lot of time! Users who need more than 3 logins can add additional ones for $5/month per user. ClassBug offers cloud-based file sharing and document storage that is accessible from anywhere, anytime, whether on desktop or mobile device. ClassBug’s activity feed enables a real-time audit of what’s been happening within Classbug, including customer activity at the web store. Three types of logins with configurable permission levels are offered by class bug: admins, non-admins, and instructors. Users can sell other items like merchandise and tickets through ClassBug using the ‘other offerings’ feature. 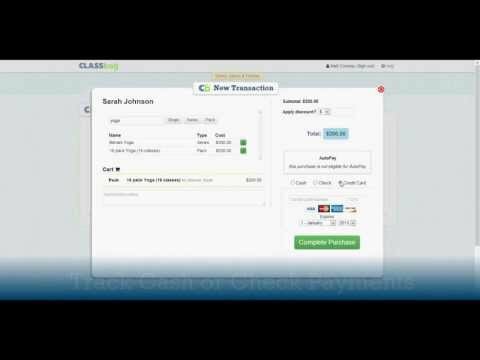 ClassBug offers an AutoPay feature which gives customers the option to pay larger tuition bills in installments based on the rules set up by the user. Below are some frequently asked questions for ClassBug. Q. What type of pricing plans does ClassBug offer? Q. Who are the typical users of ClassBug? Q. What languages does ClassBug support? Q. Does ClassBug support mobile devices? Q. Does ClassBug offer an API? No, ClassBug does not have an API available. Q. What other apps does ClassBug integrate with? Q. What level of support does ClassBug offer? Q. Which apps is ClassBug compared to most often?